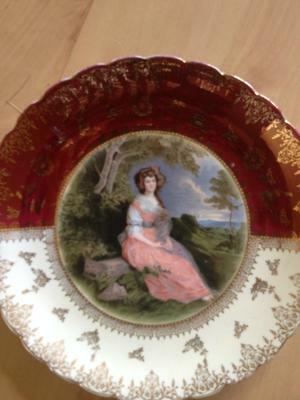 2 items - A Vienna Style Plate with black & gold pottery mark, and cup with an H and duck OR chicken backstamp:- The first item I would like to know something about is a porcelain plate with a portrait of Mrs. Elizabeth Richard Brinsley Sheridan. I know the portrait was once made by Thomas Gainsborough, he was an English portrait and landscape painter in the 18th century. 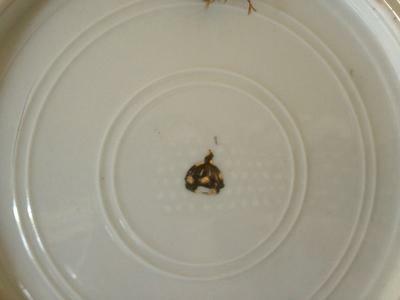 Of course I know the porcelain plate is not from that time but I would like to know who made it, underneath the plate there is a crown shaped mark that I have never seen before. I started to collect antique porcelain a couple of months ago and have bought a lot of porcelain since then, I have porcelain from France Limoges, and Versailles and Bavaria, Schumann Arzberg and DW Fine Porcelain. Anyway back to the porcelain plate, I bought it at a fleamarket and I would like to know who made it. 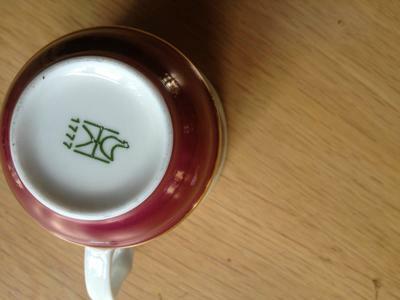 The second item(s) are some cups and saucers which i also bought at a fleamarket. 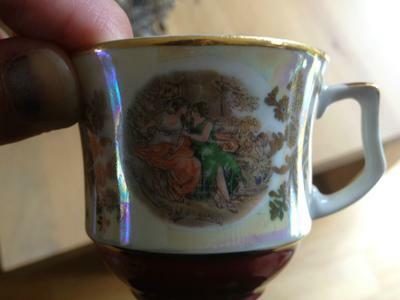 on the cups we find female figures in a romantic setting, underneath the cups it says 1777 and a chicken like mark with an H around it. I don't really care about the value i just like to know who made the porcelain and how old it is. I just like to know the history behind it. I've searched al around the web, via google, ebay and some of the websites you have recommended but i can't find any of the marks. Well done for starting your collection. A world of fascination and intrigue awaits! You may have a ker-ching moment if the plate turns out to be hand-painted (look very closely for brush marks). It is likely to be painted simply because the plate looks to be bought-in whiteware from a large supplier (the white impressed mark underneath is the clue to this, but I can't see any details of this mark). The painter is likely a small (unknown to me) decorating studio located most likely somewhere in Germany (could be anywhere) or Vienna, Austria, operating in the late 19th Century. Of course, it could be a more modern reproduction, but the over-stamped mark on whiteware pottery mark often indicates antique. It is in what is sometimes loosely described as the Viennese style plate, after the Royal Vienna factory who perfected this hand-painted panel plates. This style of antique plate was popular with Japanese collectors about 20 years ago and prices were at a premium. Now less these items can still go for a fair bit. We don't do values here, as that's the domain of qualified experts, but if hand-painted it might easily be over $100 maybe. Some examples go for much more (4 figure sums), but this is all to do with 'quality'. Only an expert looking at high resolution photos can get a feel for quality. Your second item is the mark of a German firm called Ilmenau (ilmenau), a Thuringian maker based in the town of Ilmenau. The year 1777 represents the date a porcelain factory was first opened in the town. This mark is mid to later 20th century. Good luck with your collecting, call back often. Anyone with more information on the marks on the Vienna style plate, please post. Thanks.